When used with a notebook, the EMANT300 USB 24 bit (DAQ) Data Acquisition module becomes a low cost portable, battery-operated instrument which can be configured as a six channel Strain Indicator and Recorder . When an object is stretched due to an external force and the length of the object increases from L to L+ΔL, the ratio ΔL/L is called strain. A strain gauge (gage) can be used to measure the strain of this object. The most common type of strain gauge (gage) consists of a flexible backing which supports a metallic foil pattern etched onto the backing. As the object is deformed, the foil pattern is deformed, causing its electrical resistance to change. This resistance change, usually measured using a Wheatstone bridge circuit, can be used to calculate the exact amount of deformation by means of the quantity known as the gauge (gage) factor. where RG is the resistance of the undeformed gauge, ΔR is the change in resistance caused by strain, and ε is strain. In our example, we will use one strain gauge (gage) with GF=2, RG = 120 ohms and connected in a quarter bridge configuration. The bridge is excited at VEXC=2.5V. 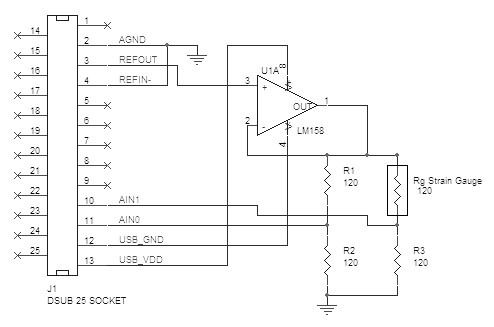 As the current required at the bridge is much higher than what is available from REFOUT, a simple buffer amplifier is required. If you prefer not to build your own circuit, you can use our Bridge Sensor Application Adaptor.